Vend Gift Cards – How can we help? If you integrate with Xero, you must map the correct account code to your gift card payment type. You must also map your account for liabilities in the Vend - Xero mappings page. To learn how to do this, click here. Vend gift cards will not work with third-party add-ons or Ecommerce providers such as Shopify or WooCommerce. All users can sell or redeem gift cards, but only admin users may view the gift card setup screen and enable Vend gift cards. Once you have sold or imported a gift card, the gift card value will be fixed and cannot be adjusted. Once you enable gift cards, a product and payment option will be created. This gift card product is tax exclusive, but tax will be applied at the time of redemption. If you currently use an existing gift card workaround or have a payment type named Gift Card, you will need to start phasing these out to use the new gift card feature. For more information on this, click here. After you've enabled the feature, you'll need to get your Gift Cards. You can purchase these from a gift card supplier or print out your own with unique codes. We recommend you use code 128 barcodes with unique alphanumeric codes between 6 - 16 characters. We also highly recommend you use non-sequential codes, this will reduce risks associated with fake gift cards and prevent people from guessing the next sequence easily. Now that you've enabled Gift Cards you are all ready to start selling! To sell a gift card, go to the sell screen and bring up the Gift Card product in the search. If you are using the Vend on iPad and think you'll sell gift cards often, you can set them up as a quick key for easy access. To learn how to create quick keys head over to this article here. When a customer comes in to redeem their Gift Card, add their chosen products to the sale as you normally would. Vend's Gift Card Reporting feature gives you a breakdown of your gift card totals for a quick overview of your gift card sales. It also contains a list of all gift cards sold, allowing you to bring up a single gift card to view its current balance and redemption status. To access Gift Card Reporting head to the reporting tab in the sidebar and select Gift Card Reports. If you want to learn more about Gift Card reporting and the kind of information you can get from it, check out this article here. Note: Currently your Gift Card report will only show you the last 1000 gift cards you have created. Important: Voiding a gift card sale is irreversible. It is important that you do not reissue a gift card using the same code if the original gift card that used this code is still in circulation. This is to prevent two gift cards having the ability to redeem the same amount. If a gift card sale has been made by accident and needs to be removed, you can use the Sales Ledger to void the sale. By voiding a gift card sale, the sale will be voided, and the gift card will be re-credited with the redeemed amount. Navigate to the Sales Ledger page and locate the sale in which the gift card was sold. Click on the sale line to expand the sale and select void on the right. How do I track my inventory when using Gift Cards? If you have multiple outlets, complete a stock transfer to ensure you have inventory on hand at each location. Although Gift Cards are trackable inventory, they cannot have set re-order points and re-order quantities. Gift Cards cannot be disabled if they are part of a current inventory count, order, transfer, or return. How Gift Card sales show in register closures? In your register closure report, you will see a table titled Gift Cards. Here you can view your total sold Gift Cards for the period as well the amounts redeemed. If you want to import your existing gift card balances you'll first need to download this template here. Once this is open, you'll need to fill out both the number column with the codes of your existing gift cards and the balance column with the balances of these gift cards. Save this file and head back to Vend. 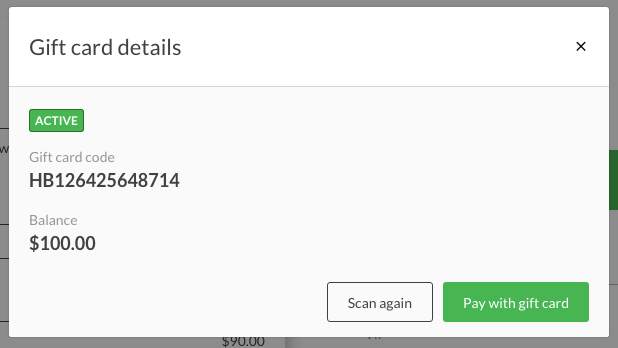 Next, navigate to Setup - Gift Cards in Vend and click the green Import CSV button on the top right. Choose the CSV file you've made using the template above. Your existing Gift Card balances should now be in the system! To confirm that this has imported correctly, check that the Gift Card totals on the Gift Card screen have been adjusted accordingly. If you receive a red error message after importing your CSV, it may be because some of the lines in the CSV have failed. If this happens, you will be prompted to download a new CSV. This CSV will include an error message, explaining why any of the errored lines have failed to import. Once you have identified which lines have an error, fix these problems based on what the error message suggests and delete the error message column. 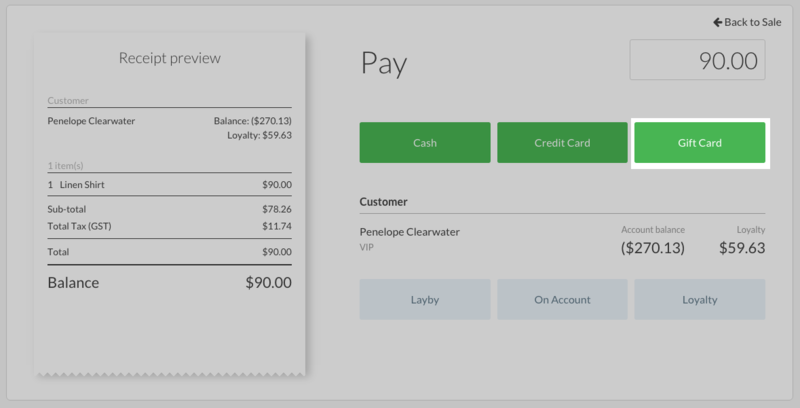 Save this new CSV file and navigate back to the Vend Gift Cards screen. Once here, click the Import button again and this time, select the new CSV file. How do I disable Gift Cards? You can choose to disable Gift Cards if you no longer wish to use them in your store. To do this, head to Setup -> Gift Cards and click the switch next to Enable Gift Cards so that it turns grey. Once you've done this, Gift Cards will be disabled, and you will no longer be able to issue gift cards from Vend. What do I need to do if I have an existing Gift Card workaround? We recommend you turn on Vend Gift Cards right away but start phasing out your old Gift Card system. If before enabling Vend Gift Cards, you have a Gift Card payment option you'll need to rename this - we recommend old Gift Card. 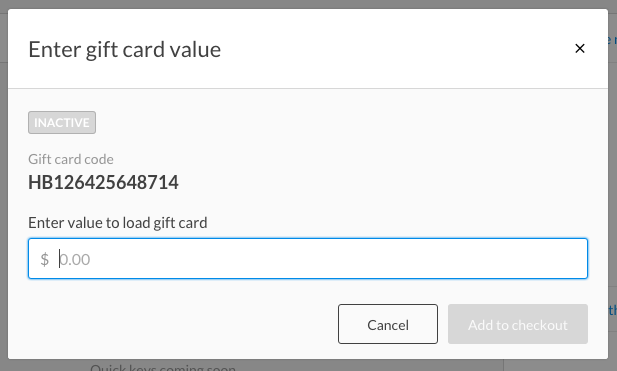 If you have an active product that is named Gift Card, we recommend that you either disable it (if you do not need it for the redemption process of your old workaround) OR rename the product so that you do not accidentally choose the wrong one. Again, we suggest renaming this old Gift Card. We also recommend you start using new (visually different) Gift Cards so you can easily identify if the Gift Card your customer is trying to redeem requires you to use the old process or the new redemption method.